The Sreepur Village Outreach Project. 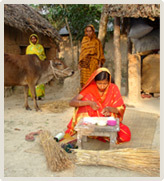 When Sreepur Village first opened it was in a rather isolated area of rural Bangladesh. A security fence was built around the project for the protection of not only the children but to secure the equipment held on site. The fence a first made it difficult for interaction with the local people. A tarmac road was built to connect Sreepur to the main road and over the years a new farming community has grown up along that link road. The women of this community have tough lives, bringing up families on less than £5 per week. Job opportunities are few. If they want to work in the garment factories they face a walk of several miles and a 8 hour shift, 6 days a week for about £15 a month. The Sreepur Village Outreach Project was an opportunity to help the local community and provide vital funding for the project. 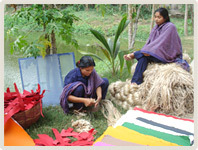 It gives the local women training in card making, courses in health and hygiene plus general welfare support. The women make the cards at home, for which they are paid a fair wage without having to leave their children. With the help of British Airways the charity is able to bring the cards back to the UK and return every penny from sales to Sreepur Village.